Today's Draw: The Hanged Bird from the Badger's Forest tarot. Is there some sort of roadblock or delay standing in the way of progress in your life? What are you doing about it? Have you considered just enjoying it? 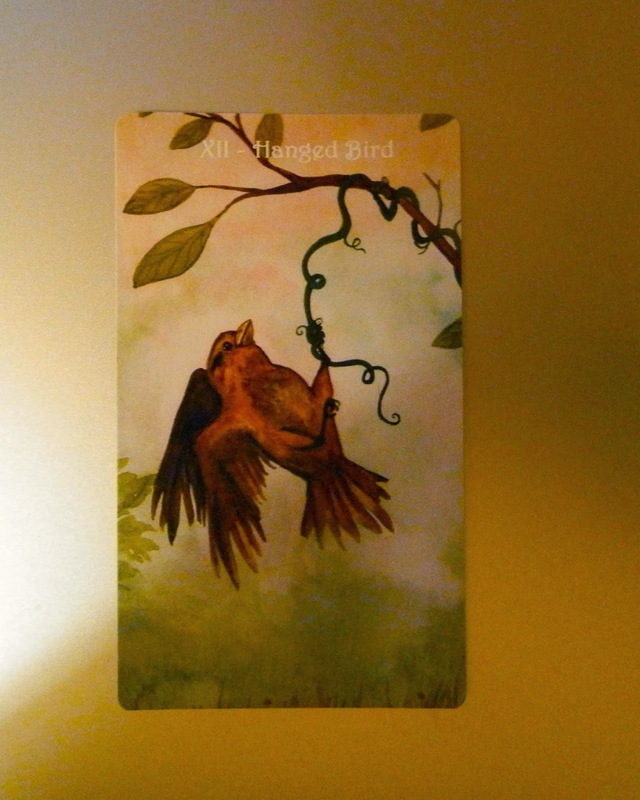 The Hanged Man (Hanged Bird in this deck) is one of those cards with lots of meanings. It can be about making a sacrifice. Time in suspension or waiting. Seeing things from a different perspective. Surrender. Traditionally, the hanged man is hanging so casually that you sense his predicament is voluntary or at least welcome. Regardless, any kind of struggle would not free him. He's trapped there for a bit. Many times when we're working toward a goal and come across a roadblock or delay, it's frustrating. We try other avenues. We push harder. We struggle against what is. But the Hanged Bird is coming to us today to say, "if you can't move forward, hang out and enjoy the view." Or "if you don't know how to move forward, detach from the situation for a bit and, while detaching, the answer may come." Surrender is one of those hard things for us to do. We're socialized to keep moving, pursuing or, at the very least, to stay busy. You can probably think of a time in your life that you had something really important to accomplish, then you broke your leg or got sick or something else came along to delay you, like a snowstorm. Consider that these things may have happened to slow you down long enough to think or process things. We see such delays as obstacles or inconveniences when they actually might be gifts. Sometimes we've just to detach. Surrender. Let go.